The second half of this year sure has started with a political bang! Chaos seems to abound on Capitol Hill and the “what abouts” appear to be never ending. While Federal Reserve Chairman Jerome Powell’s testimony to the Senate Banking Committee was reassuring, what about the 12 Russian officials indicted for tampering with the 2016 election? What about NATO? What about the summit between Presidents Trump and Putin? What about the escalating tariff threats? It’s easy to get lost in all of the doom and gloom of these “what abouts.” Chaos can bring a huge degree of uncertainty, and that can breed fear. What can we do? Well, whenever I feel a tug of anxiety concerning the markets or the news, I turn to the facts. To remain as objective as possible about the markets, our Investment Management Team follows 30 important economic indicators each month. We use them to cut through the noise and create a pretty good picture of how well (or poorly) the economy is doing. Our review can show us what the stock market has going for (or against) it. I thought I’d share with you a sampling of those indicators and how we interpret the data. As you can see from the left side of the chart above, S&P 500 earnings have been skyrocketing since 2015. 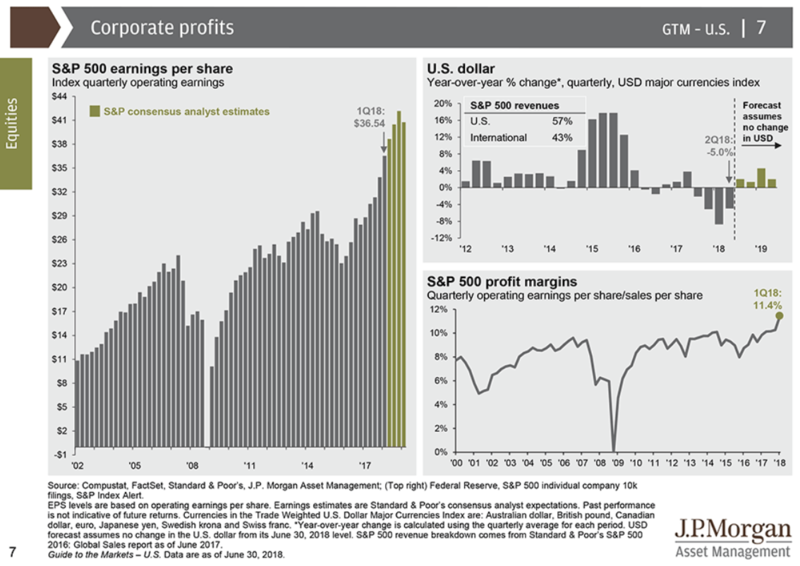 Not only that, but S&P 500 profit margins reached a new high as of the first quarter of 2018. This tells me that these earnings aren’t vaper, but tangible improvements to the bottom line. However, I don’t believe this boom will last forever. Notice how earnings projected to keep climbing for the next four quarters and then drop a notch lower in 2019? The reason is due to higher inflation, rising interest rates, and trade tariffs. Those will be a big drag (literally and figuratively) on corporate earnings after the “new car smell” of the tax cuts wears off. We are well aware of these risks that lie on the murky horizon of the future and keep a close eye on how they may impact the markets. According to the US Bureau of Economic Analysis, US GDP growth is projected to hit 2.8% in 2018 then fade in 2019 and 2020. Their projection is due to a growing deficit and higher interest rates. As the deficit grows, government borrowing increases. Higher government borrowing puts upward pressure on interest rates because the government is competing with the private sector for limited capital. This is what economists call “crowding out,” and the result is slower economic growth. Notice how the bullseye of risk shows up again in 2019 and into 2020. This is the same time frame that corporate earnings are expected to slow. What do you get when you combine a sideways stock market with rising earnings? A lower price to earnings ratio! Known as the “P/E ratio” it is one of many metrics that show how cheap or expensive a stock is when compared to its peers. A lower P/E ratio means the stock is potentially inexpensive. A higher P/E ratio means the stock is potentially pricey. An important side note I need to make is that this isn’t the be-all-end-all metric to determine whether or not you should buy something. A stock with a low P/E might be a terrible company. A stock with a high P/E might have a higher growth rate than their peers and they’re knocking the cover off the ball. But in this context, we look at the P/E ratio for an entire index: the S&P 500. The S&P 500’s P/E ratio was higher than its 25-year average early this year, meaning S&P 500 stocks were pricier than average. 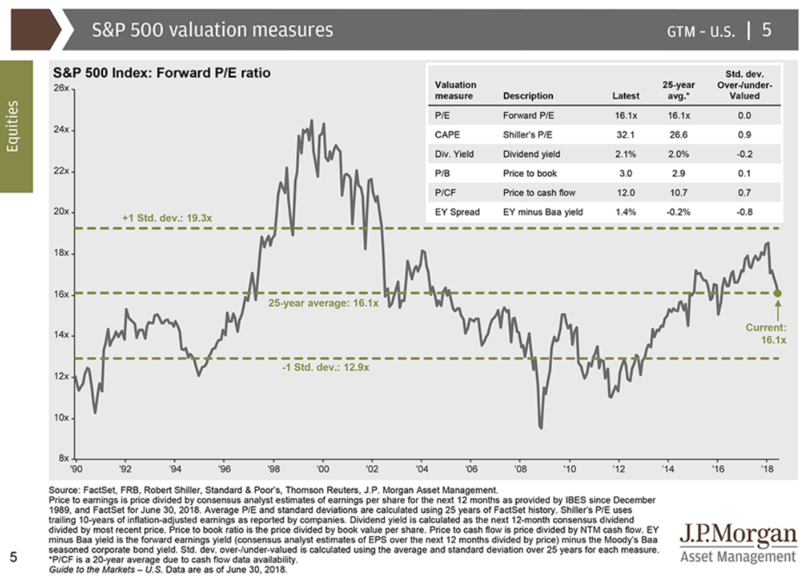 Notice how the S&P 500’s P/E ratio is right at its 25-year average now. It’s no longer as overvalued as it once was. This is because the stock market has been moving sideways this year while earnings have been gaining. The ”price/earnings” ratio went down because ”price” was the same while ”earnings” went higher. I interpret this to mean that we aren’t in a stock bubble like we were in the late ‘90s. I don’t see over-exuberance in the market. These are only three examples of the long list of metrics we follow every month. I do see a positive end to 2018 when I look at the big picture. But it’s important to not get ahead of ourselves. We understand that the current landscape can change due to inflation, interest rates, and the deficit as we head into 2019. If corporate earnings can’t outrun those big hurdles, the stock market will probably struggle. If headwinds begin to blow too hard it might be time to make some adjustments toward calmer waters. For now, we’re enjoying the relative calm before a potential 2019 storm. As always, if you have any questions regarding your accounts, please call your financial advisor. We’re here for you! Securities offered through Cetera Advisor Networks LLC, Member FINRA/ SIPC. Investment Advisory Services offered through Cetera Advisor Networks LLC and McDaniel Knutson Financial Partners. Cetera is under separate ownership than any other named entity. The views are those of Victoria Bogner and should not be construed as investment advice. All information is believed to be from reliable sources, however, we make no representation as to its completeness or accuracy. All economic and performance information is historical and not indicative of future results. All information is believed to be from reliable sources, however, we make no representation as to its completeness or accuracy and is not a complete summary or statement of all available data necessary for making an investment decision. Any information provided is for informational purposes only and does not constitute a recommendation. Economic and performance information is historical and not indicative of future results.